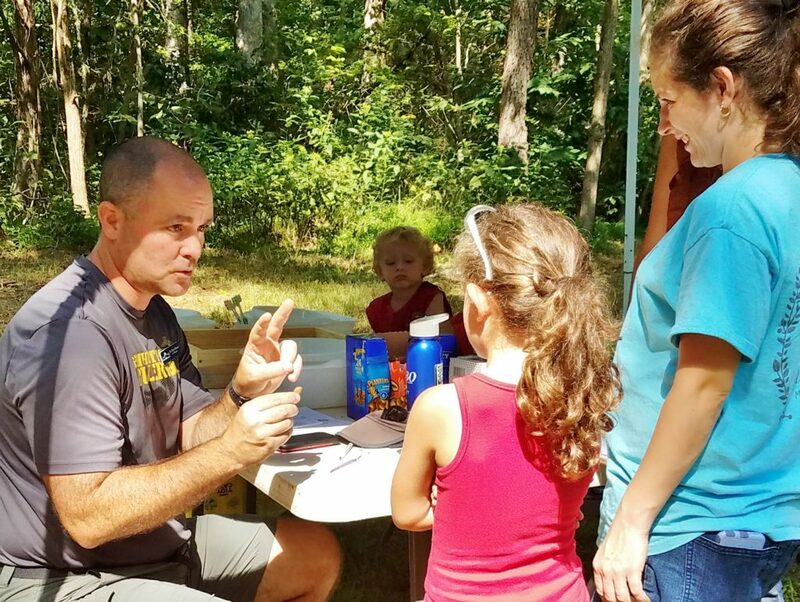 If you’ve never joined the Fairfield Foundation for a public dig at New Quarter Park in York County, then you’re missing out on some exciting finds! 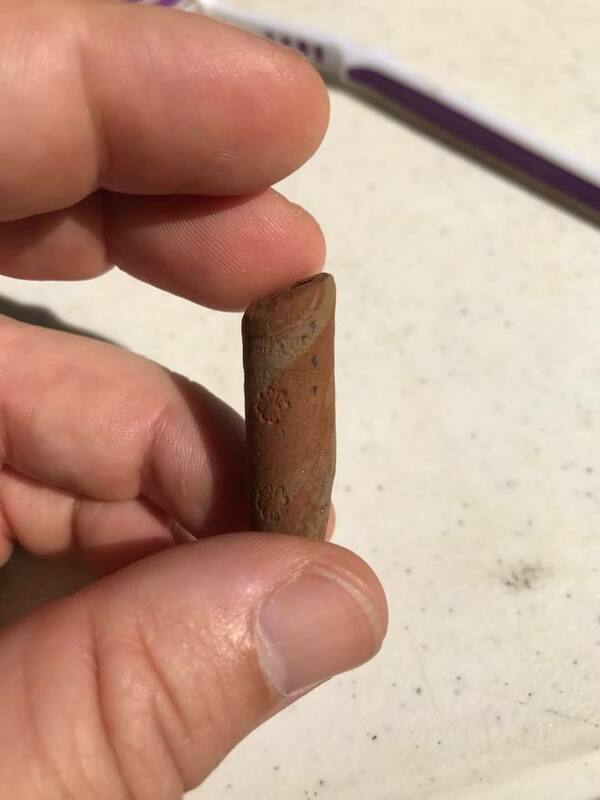 In the most recent round of excavations, a young volunteer was excited to find this Very Cool Artifact: a locally-made tobacco pipe stem fragment that was likely produced by the ‘Bookbinder’ maker in Virginia Beach during the mid-17th century. Read on for more details about the discovery! Beginning in 2006, a series of multiple-day excavations at the Ellyson Armistead site (44YO25), located on a bluff overlooking Queen’s Creek in York County’s New Quarter Park, have revealed nearly 50 test units full of intriguing material culture. Artifacts from the original 5′ x 5′ unit, excavated in 2006 and 2007, and from the smaller 2.5′ x 2.5′ units excavated since 2013, include evidence of Native American tool-making as well as occupation by Europeans and African Americans during the 17th and 18th centuries. The 17th- and 18th-century history of the site was unknown before archaeologists with the Fairfield Foundation discovered a rubble-filled cellar in 2015. Rich with fragments of ceramics, glass, and metal, the site offers a plethora of artifacts dating to the colonial period, but almost none beyond the very early years of the 1800s. The preponderance of material goods reflects occupation by a family of means. These findings made us question our assumptions about the nature of the site and lead to a deep dive into York County’s extensive early records. This work points to Ellyson Armistead, York County Sheriff and Justice of the Peace, as the likely first occupant of the manor house with its brick cellar during the second quarter of the 18th century. After his death in 1757, his eldest son, Robert Booth Armistead, and his second wife, Jane Anderson Armistead, continued to live on the property until their deaths in 1766-1767. This research adds depth and complexity to a site whose many artifacts will yield insights into the lives of the diverse people who lived there, including several landowning families and numerous enslaved African laborers. 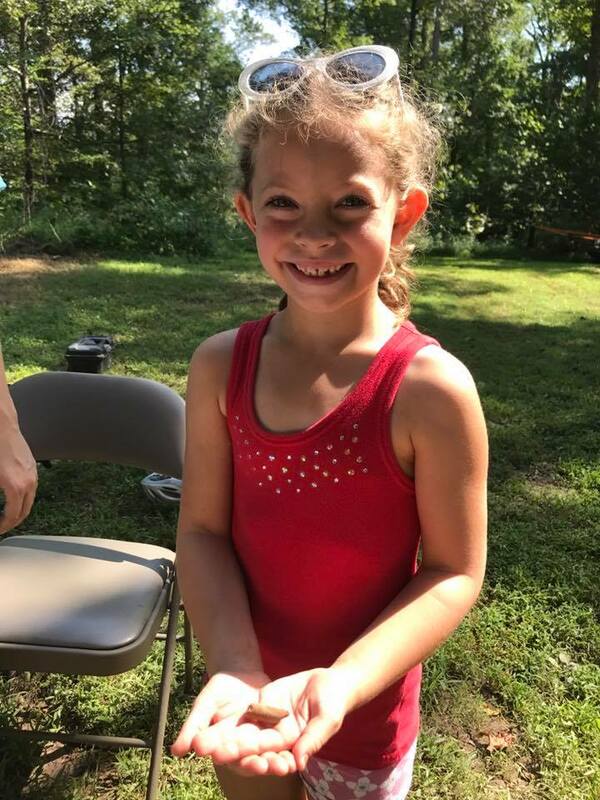 During this year’s September public excavations, a young girl named Madelyn rushed over to Dr. David Brown, Fairfield Foundation co-director, to show him the stone-like tube that her mother and aunt thought was a stick and nearly threw aside. Dr. Brown was immediately excited to see the two-inch section of red and yellow marbled-clay pipe stem. He explained to Madelyn she had uncovered something very special. Her eyes were wide with wonder as he regaled her with more information. After sending Madelyn off to show the prize to other staff and volunteers, Brown posted the find to his colleagues on Facebook for more information about its origin. He received a quick reply, confirming that the pipe was made in the distinctive style of a craftsman known as Bookbinder, whose 1640s-era work is characterized by marbled clays, reminiscent of marbled paper designs, and stamped patterns, like those used to emboss and gilt leather book covers. In their 2006 article in Ceramics in America, Al Luckenbach and Taft Kiser ascribed tobacco pipes uncovered at Tidewater archaeology sites to a number of makers based on their consistent use of decorative themes. According to their classification, the marbled and stamped pipe stems similar to the one Madelyn found at the New Quarter Park public archaeology dig reflect the grammar of the “Bookbinder school” of pipe making. 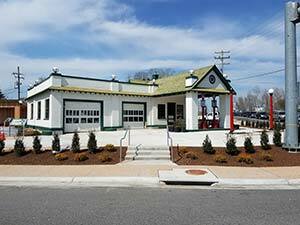 According to Luckenbach and Kiser, the Bookbinder manufacturing facility was located in the vicinity of the Chesopean site (44VB48) in Virginia Beach. Unlike other pipe stems, which are found mostly near their place of manufacture, Bookbinder-crafted tobacco pipes have been recovered at a variety of Tidewater sites. 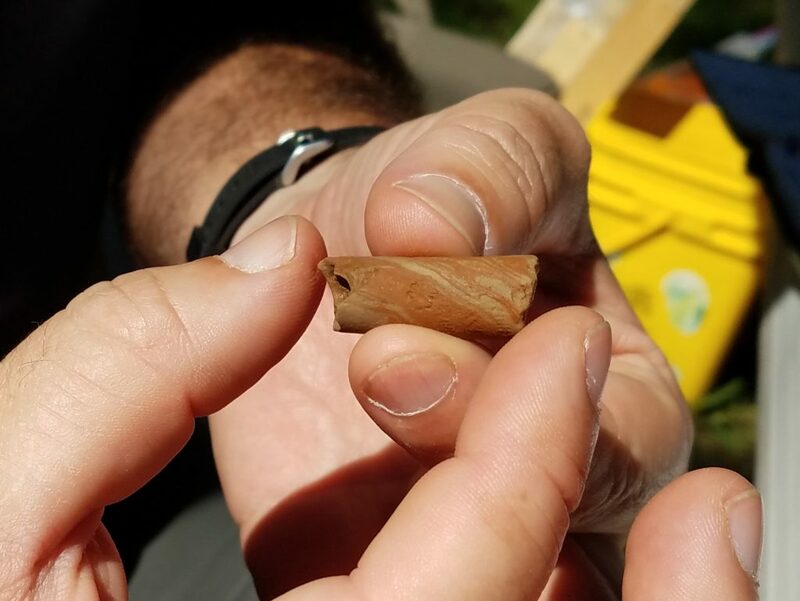 In addition to being found around Virginia Beach, Bookbinder pipe stem fragments have been recovered at Shirley Plantation, Kingsmill, Nomini Hall, Nansemond Fort, Bennett Farm, College Landing, and Jamestown in Virginia, as well as at St. Mary’s City and other sites in Anne Arundel County. Bookbinder pipes have been recovered as far away as Newfoundland. They speak to an emerging system of trade both within the Virginia colony, and beyond, but also elicit questions about the age of the New Quarter site. Who enjoyed a few puffs from the Bookbinder pipe as they stood on the Queen’s Creek bluff with its view toward the York River nearly 100 years before Ellyson Armistead? Around 1730, Armistead had taken charge of the land through a complex legal procedure involving tenants and landlords. Armistead’s case pitted him against Graves Pack, the second husband of his uncle Thomas Booth’s wife. Both sides of the family descended from 1652 land patentee Robert Booth. So, did the pipe belong to Robert Booth? Perhaps, for he is named in early patents for nearby land as well as the New Quarter Park property. But there are other candidates as well, as Booth’s patent for 400 acres on a neck of land on the south side of Queen’s Creek incorporated earlier patents to John Bell, William Reynolds, John Wilson, and Ralph Green. Geographical markers include Hartwell Creek (today’s Cub Creek) and Maiden Swamp Creek (today’s Queen’s Lake impoundment). Neighbors include John Utey, whose land is now Cheatham Annex. During the 17th century, Utey’s land was sold to William Taylor and then descended to Abigail Smith, who married Lewis Burwell, builder of Fairfield Plantation (Gloucester County), in 1674. Burwell’s outlying farm named New Quarter was located on the Cheatham Annex property, which inspired the name of the park. As research continues at the Armistead site, and potentially others on the park property, we hope to learn more about this community of diverse people as it developed across three centuries. Although excavations at the site have ended for the 2017 season, the excitement of the Bookbinder find will no doubt carry into the 2018 spring excavations, which will focus on a section of the cellar in order to shed light on the construction and destruction of the Armistead manor house. Stay tuned for more information about these excavations by following the Fairfield Foundation on Facebook, viewing the calendar of events on the Foundation’s website, or checking out the calendar of events on the New Quarter Park website! 2006 Seventeenth-Century Tobacco Pipe Manufacturing in the Chesapeake Region: A Preliminary Delineation of Makers and Their Styles, in Ceramics in America 2006, Robert Hunter, ed., p. 160-177. Hanover, NH: University Press of New England. 1934 Cavaliers and Pioneers. Richmond, VA: Dietz Printing Co.
Sara E. Lewis is a park interpreter at New Quarter Park and a Fairfield Foundation volunteer. She holds a BA in History and Art History from the College of William and Mary and an MA in Art History from Virginia Commonwealth University. She served as curator of collections for the Mississippi State Historical Museum from 1979-1982, then returned to William and Mary to earn an MBA degree. Afterwards, she held a management position with the WILLIAMSBURG Reproductions Program at Colonial Williamsburg. She has authored three local history volumes for the Arcadia Publishing Images of America collection on Gloucester County, Mathews County, and James City County. How very exciting for Madelyn to find such a treasure. Bravo Madelyn! What an excitement on a great find. Congratulations Madelyn ! 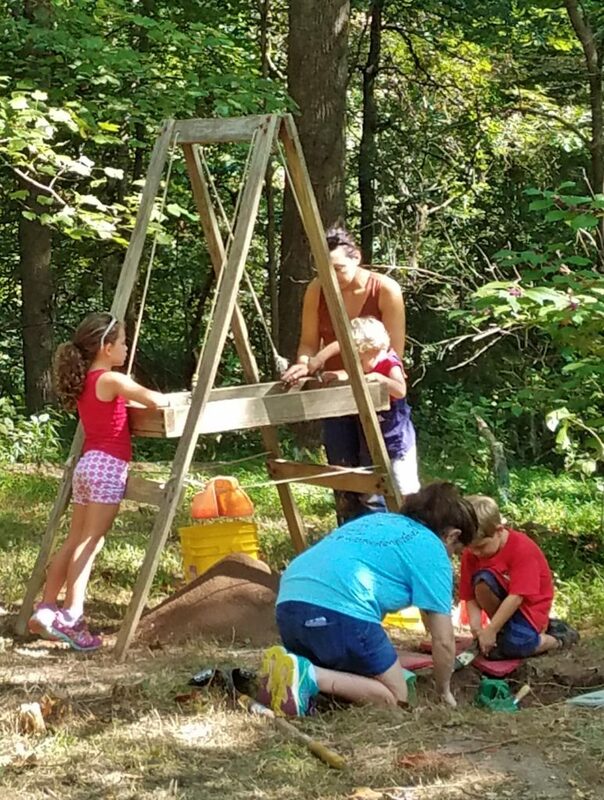 It’s so wonderful that The Fairfield Foundation can educate the young and keep the importance of Archaeology informed to the Public. I knew upon my first meeting Dr. Brown, that he had a special Love and Talent regarding his profession. Dr. Brown and his entre staff share the same enthusiasm with their activities. To all the Staff and supporters of the Fairfield Foundation, Thank you.